Lisa Smith recently took over the leadership of several modules on the Practice Development Framework. Some of the modules have some face to face elements but others are delivered totally online. Structured materials and resources are provided via Blackboard with the main learning and interaction takes place through weekly ‘thread work’. These are structured topics of research which the students need to post their findings on. There is also the expectation that they will also read and respond to work posted by their peers and in this way they learn from each other. What was the challenge you were trying to address? As a distance learning module with a large number of students (60+) I was looking at a way to manage the Discussion Boards better. I give individual feedback to threads, and found it hard to keep track of the Discussion Board postings I had already marked. I also wanted the students from all levels of study (5, 6 and 7) to work together as I felt they would all benefit from seeing all the work submitted by their peers. The approach of putting them into smaller groups depending on their level, defeated this objective. Essentially, students can post their thread work and easily choose another student’s work to read without having to scroll through large numbers of posts as was the practice on a discussion board. What advice would you give to others looking to implement something similar? Seek advice from the learning technologists! With a large number of students it is easier to see who has submitted and who hasn’t Rather than having to scroll down through large numbers of threads you can just click on each student’s blog and read their work and the comments of other students. The students themselves are still able to easily engage. When marking thread work you can see who you have read and those who have submitted since the last time you accessed the blog. There was very little to be negative about but if I had to identify something, it would be the absence of an edit feature after feedback has been posted. If you have written something and want to correct it after submitting it, you cannot simply go back and edit it. You have to copy your original comment, delete it and then paste it into a new comment with the edits. This is only a very minor negative though. If you are going to implement Blogs, make sure you do it from the outset. I decided to introduce this approach after students had already engaged via a Discussion Board. I quickly realised I would struggle with this particular module as I had so many students on it. So implemented the Blog for week 2 of the thread work. Some students got a little confused with the new process, however we gave them a lot of guidance on how to submit, but some still got a little lost. 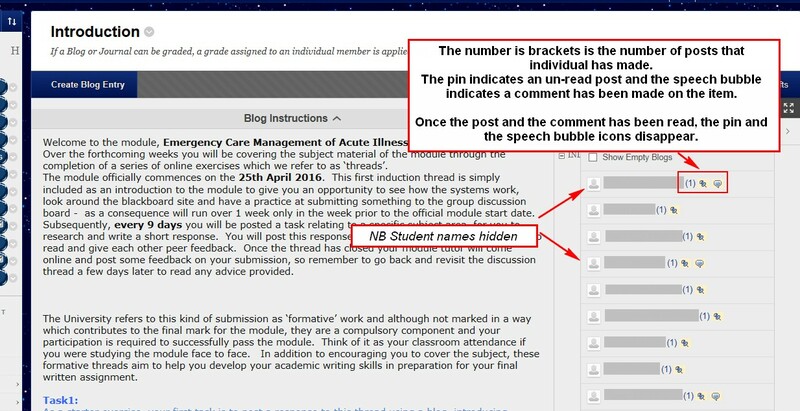 Make sure that the ‘Group Blog’ feature is turned off (if you are using Groups in your Blackboard site) as this will give students two places to submit to and cause great confusion – learn from my mistake! All my modules now use Blogs for threadwork submissions. At first the students need a little help to navigate the blogs but this settles down quickly. Both the major’s and minor’s modules showed a high level of interaction between the students. A recent student evaluation mentioned that they enjoyed using the blogs. 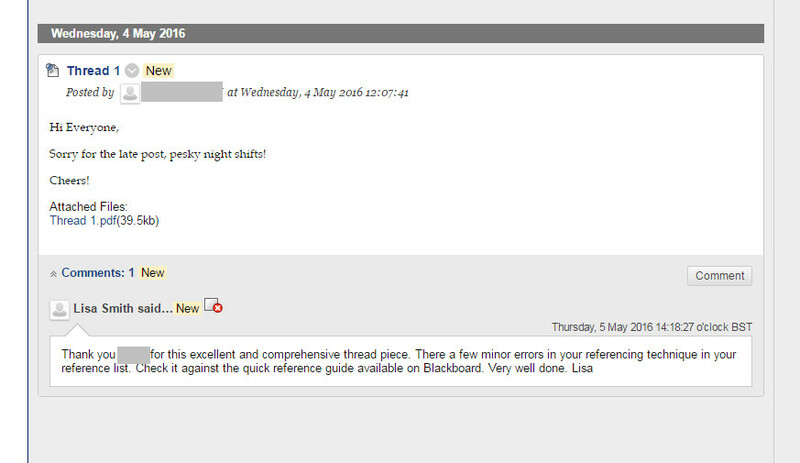 Use blogs for all thread work in the future. This entry was posted in Case Studies and tagged Blackboard, Blackboard Blogs, Lisa Smith.